This week, two league games took place and the first leg of the League Cup semi-finals, with Great Ecc facing Loko in their previously postponed clash. 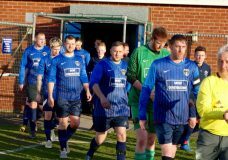 Meanwhile, Quernmore faced Lancaster, hoping they could repeat their victory from earlier in the season, whilst Moorlands traveled down to Fulwood. Wray vs. Preston City Mission has been postponed and moved to the 31st March. Before the game, James Rosendale shared his testimony with the players, explaining his Christian walk to them all before sharing a verse that both challenges and encourages him – Romans ch7 v24/25 – “O wretched man that I am! Who will deliver me from this body of death? I thank God—through Jesus Christ our Lord!” Within 30 seconds Lancaster were ahead, a through ball came to the feet of White, who placed it past the keeper. Quernmore didn’t settle and made a poor start, similarly to Accrington last week, there wasn’t much passing between the team. Quernmore did have some chances, though none that were much of a risk to the Lancaster goal. In the 22nd minute, Lancaster got their second. After some of the defense didn’t push up, White was left onside and again found himself one on one with the keeper. He managed to get the touch past him, leaving him with an open goal to aim at. The next three goals were virtually carbon copies of each other. For each of the next three goals, he again got played through, coming into the left side of the box and firing it past the ailing keeper each of the three times. Half time and it was 5-0. Quernmore were disappointed with the performance and knew they need to improve in the second half. And the performance did improve a little in the second half, starting to pass more. They got a few chances and started to put Lancaster under pressure, whom were less of a threat in the second half without White up front. 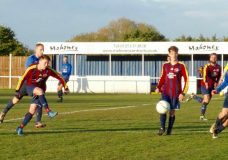 However, in the 54th minute, a corner played into the box bounced around and then was slammed home by midfielder Longton. The pressure continued to build on Lancaster, Quernmore looking for a second. They found it 10 minutes later, Bakri smashing it home after Fox chipped the keeper. Quernmore continued to press but couldn’t find a third. Lancaster reacted to this by bringing White back onto the pitch. In the 80th minute, a mistake by keeper Rosendale gifted White his sixth of the game. A cross into the box was parried straight into Whites path, who made no mistake in firing it home. In the 83rd minute, Lancaster got their seventh of the game, White firing the ball through a crowd of bodies and into the bottom corner. And that was to be that, the final score 7-2. 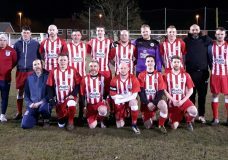 In a reply of the cup tie from a few weeks ago, Moorlands once again traveled down to Fulwood, hoping this time they would be able to get the victory instead. Moorlands hopes improved as the match started, Josh Kirkby netting for them in the 26th minute. However, shortly after half time, Moorlands were to be pegged back, as Matt Vjestica netted in the 48th minute for the hosts. The next goal, as always, was going to be crucial. It came to Fulwood. 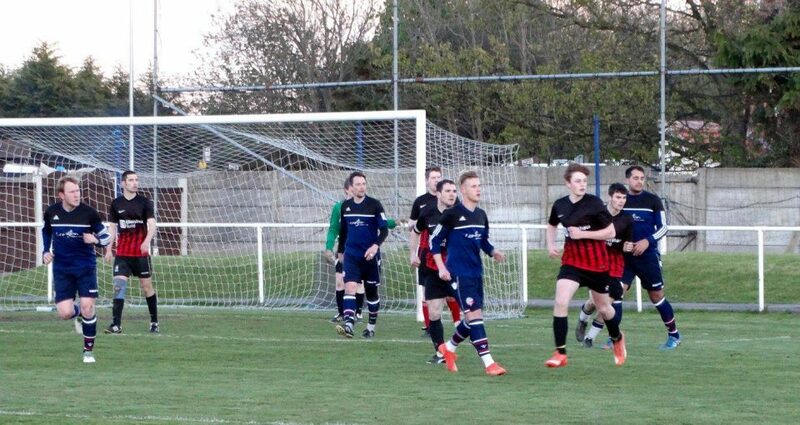 Jack Mansfield netted in the 63rd minute, giving Fulwood the advantage and 15 minutes later, they had further increased their advantage, Rick Atkinson scoring in the 78th minute to make it 3-1. However, that was not the end of scoring, as Nick Grundy scored a late penalty for the visitors. 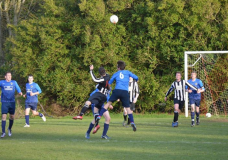 However, it was too late and Fulwood ended up winning this match up again. Moorlands have one more chance to get one over on Fulwood this season, facing them in a few weeks time, back at Saltayre! Simon Mourinho (Si Greenhalgh) and Pep Leech (Jonny Leech) takes charge today as Tomkins is nowhere to be seen. It’s a cold but sunny February afternoon, with a hard and wet playing surface, and the gaffers have ringed the changes, setting up in a 3-5-2 formation. There was a great word from Ollie Parkinson, with an even better prayer! 4 minutes in – Tom plays a wonderful ball over the top, David Silva-esque! Bill takes a shot which is saved well, only for Kevin de Parkinson (Dan Parkinson) to swipe a right footed effort into the middle of the goal – 1-0 Great Ecc! A fantastic start for the hosts. 8 minutes – Lionel Pulford (Dennis Pulford) picks up the ball just inside the Eccy half. Like he used to in his youth, Pulford slots his ball in between the legs of the nearest human possible. 13 minutes in – Birkett sends a ball forwards for the ever running Bill. A couple of stumbles later and the referee gives a penalty! Up steps Bill Gibbons – never in any doubt! 2-0 Eccy! After 26 minutes there was a rare attack from Loko as their number 10 took a shot to no avail and it is still 2-0 to Great Eccleston. In the 29th minute, Loko were awarded a free kick, in which Great Eccleston weakness is shown again as the ball gets lofted into the box. The ball finds its way into the net, courtesy of Graeme Beaumont. In the 47th minute, there was a goal of the season contender! Tom Sheilds threads a ball through for the ginger ninja, Cristiano Parkinson (Dan Parkinson), who takes a touch, cuts inside two defenders and rifles an unstoppable shot in off the right hand post! Great goal! 3-1 Eccy, And that’s half time! In the 51st minute, a Loko free kick was sent into the box and with safe hands from Dan Birkett, he catches the ball with ease, giving Loko a penalty! Brad Rodwell steps up and scores the penalty, 3-2! Another free kick in the 54th minute gives Loko the chance to send another ball into the box – with great success! Mark Williams nets for the visitors who are back on level terms! In the 56th minute, Pulford showed great strength to win a corner. A pinpoint cross from Moat floats over to Pulford’s head, who with a great header, puts Great Ecc back in front. 4-3! In the 67th minute, Great Ecc found a fifth and it was a great team goal. Long ball from Greenhalgh, great hold up play by Pulford to play Leech through for a fantastic finish under the keeper! 5-3 to Great Eccleston! In the 78th minute Glenn plays a 1-2 with Si and finds a guy at the back stick, fantastic save from Jamie de Gea (Jamie Greenall) followed by a brilliant goal line clearance from Adam Neville (Adam Moat). Ball drops to the edge of the area with a strike forcing another brilliant save from Eccy keeper, still 5-3! Following that, the referee brings the thrilling game to a close, with the second leg scheduled for this coming Saturday, hopefully there is another exciting game on the horizon! With thanks to Simon Mourinho and Pep Leech for their match report.